This wok is about as far from traditional materials as you can get – which makes it great for the modern cook in a contemporary kitchen. It’s made from heavy gauge hard-anodized aluminum with three layers of nonstick coating on the cooking surface for durability. And of course the nonstick coating helps prevent the food from sticking and burning, which is a risk when stir-frying. The aluminum heats quickly and evenly and the stainless steel handle is designed to stay cool on the stove. This wok has a flat bottom that’s a bit larger than the bottom of a traditional wok so you get plenty of heat in the center for stir frying. You can use it on any gas or electric stove, but since it’s made from aluminum, it won’t work on an induction cooktop. It includes a domed cover for steaming, or you can use the wok for simmering, braising, or frying. This is a little small compared to more traditional woks, since it’s only 10 inches in diameter at the rim. The sides have a steeper slope than some woks, so it’s more compact for storage. 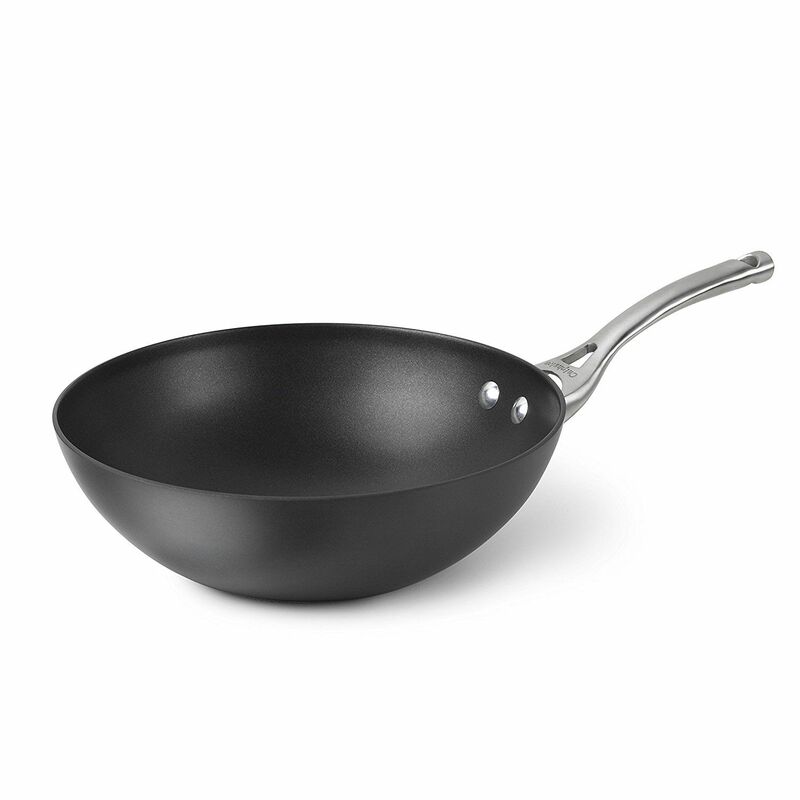 This is a great starter wok for someone who doesn’t want to store a large a large wok or who prefers a pan that’s not quite so specialized. This wok is oven-safe to 450 degrees and dishwasher safe. It has one long handle with a hole for hanging. Woks are not typically expensive pieces of equipment, but this one is particularly wallet friendly. The large 14-inch wok is great for cooking large family meals, while the nonstick cooking surface makes it easy to use and clean, since food won’t stick. This wok is made from aluminum, so it’s lighter in weight than steel woks. It’s oven safe to 350 degrees, and it’s also dishwasher safe, for easy cleaning. A large wok can be a bit difficult to fit into a dishwasher, but this is nonstick inside and out, so it’s easy to wash by hand, too. Since this is made from aluminum, it can’t be used on an induction cooktop, but since it has a flat bottom, it can be used on any gas or electric stove. It has a long handle, and a helper handle that makes it easy to use and move, and the handles are covered with silicone for a stay-cool comfortable grip. The inside bottom has a flat cooking surface that’s more typical in modern woks. This 12-inch wok has an aluminum core inside of dual layers of stainless steel, so it heats evenly, provides fast browning, and it can be used on any type of cooktop, including induction. The exterior is brushed stainless steel for an elegant look, and since it’s stainless inside and out, you can use metal utensils in it with no problem. This comes with a tempered glass lid, so you can use it for steaming or other cooking purposes, and you can watch what’s cooking. Both the pan and lid are oven safe, so you can finish a dish in the oven, or keep it warm for serving. The pan is also broiler safe. This wok has a flat bottom inside and out, so it can be used on any type of stove. It has one long handle and one helper handle, so it’s easy to use and easy to move. Carbon steel is a very traditional material for woks, but it has some downsides that a home cook needs to be aware of. Like cast iron, carbon steel needs to be seasoned to keep it from rusting and it can’t be washed in a dishwasher. When this wok is hand washed, it needs to be dried immediately and oiled before storing to keep it from rusting. A well-used carbon steel wok will turn black from use and will become more and more nonstick over time. When carbon steel is heated, it emits a metallic odor that some cooks find objectionable. This odor becomes less noticeable as the wok is used and seasoned over time. Since carbon steel is so prone to rusting, woks are sold with a coating that must be removed before the wok is seasoned before its first use. It’s important to read the specific instructions included with the wok for the proper way to remove the coating. This wok is made from cold forged carbon steel with two riveted loop handles and a very traditional round bottom. You’ll need to use a wok ring to hold it on your gas stove. It won’t work well with other stovetops, since the round bottom won’t make contact with the heat. While carbon steel is one of the most traditional wok materials, casual home cooks might find the care and seasoning to be more than they want to deal with unless they’re passionate about wok cooking. At 16 inches, this is also a large wok that will take quite a bit of storage space. This 14 inch wok combines traditional carbon steel construction with a premium nonstick surface that’s safe for metal utensils, so it doesn’t require the finicky care of an uncoated wok. However, wood, nylon, or silicone utensils will help extend the life of the nonstick surface. The wok has a long maple wood handle and a helper handle that look attractive and stay cool during cooking. It also includes a domed lid. This is great for a first-time wok user since it includes the many of the tools needed, including a tempura rack, a bamboo spatula, bamboo cooking chopsticks, six pairs of bamboo dining chopsticks, a steaming rack, bamboo tongs, and a bamboo rice paddle. This pan should be hand washed without any abrasive pads or cleaners. It should not be washed in the dishwasher. Because of the wooden handles, it is not oven safe. This pre-seasoned cast iron wok offers the benefits of cast iron cooking combined with lightweight construction. It’s large enough to cook dinner in a single batch, whether you’re making fried rice, stir-fry, or fajitas, yet it’s much lighter than traditional cast iron woks so it’s easy to lift, move, and store. Since it comes pre-seasoned, you can start using this wok right away, but the surface gets even more nonstick with additional seasoning and use. This should be hand washed. 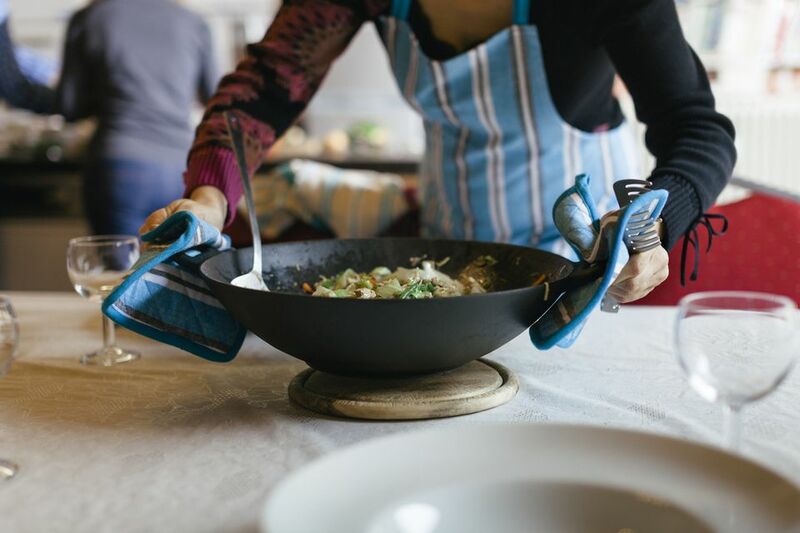 Round-bottomed woks are traditional, but they need a few extra pieces to make them compatible with your gas cooktop at home. This set includes everything you need, with a classic design that will make you look like a wok expert in the kitchen. The set includes a single-handled round-bottomed wok, a domed cover with wood handle, a wok ring, a pair of cooking chopsticks, a spatula and a ladle. The wok is made from traditional cold-rolled carbon steel. All other parts are stainless steel and/or wood. Since this has no coating, you can use any type of utensils in the wok, but it should be seasoned before use. This should be hand washed.